I know, it’s the time of year for healthy recipes. But I’ve been good all week – eating low in added sweeteners of any kind, exercising daily, packing in those good nutrient-dense foods – and now I feel like baking! 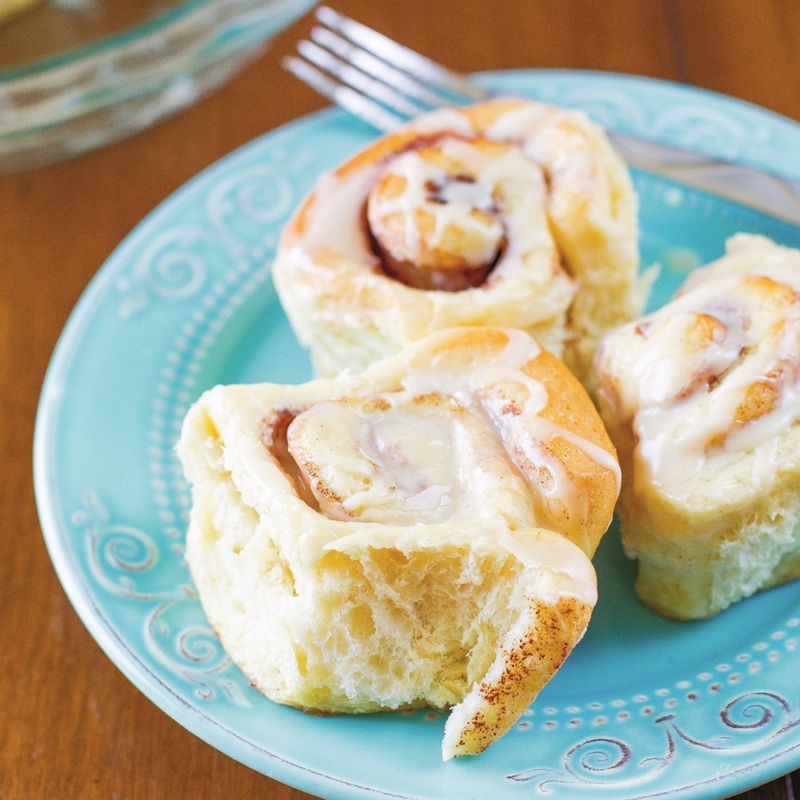 We all deserve a little reward now and then, and for me, it’s definitely some time with my beloved oven while preparing a treat like these delightful dairy-free cinnamon rolls. Admittedly, my go-to recipe is still these Double the Cinnamon Rolls from my kitchen, which we whip up on special occasions. They are dairy-free, and even egg-free / vegan, and can’t be beat! But the recipe below for dairy-free cinnamon rolls offers wonderfully tender results and is a variation that I felt worth including on Go Dairy Free. 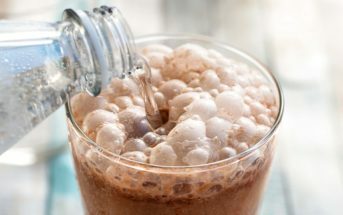 The original recipe (and image) was shared with us by Red Star Yeast, and created by cookbook author Gesine Bullock-Prado – though we have slightly modified it. To achieve bakery-quality results, Gesine says that you must use the best quality ingredients you can find. Fresh yeast, baking powder or baking soda will give a tender, airy texture to your baked goods. Dairy-free cinnamon rolls, cakes, and breads made with ingredients that are too old, will often fall flat. Great flavorings, such as pure vanilla extract, fresh eggs, and a good brand of flour are also essential. For Vegan / Egg-Free: I’ve included an egg-free option for this recipe, but for a naturally egg-free and vegan recipe, enjoy my time-tested and beloved Double the Cinnamon Rolls. For Soy-Free: Remember that dairy-free margarine often contains soy, but you have a couple of options. Look for the soy-free varieties from brands such as Earth Balance, or substitute in palm shortening or coconut oil – yes, it works! If using coconut oil, you can reduce the amount in the filling by just a touch. Set aside ½ cup of flour. In a large bowl, toss 2-1/4 cups flour, the sugar, salt, and yeast together until evenly dispersed. Heat the water, milk alternative, and margarine together in the microwave until the mixture is very warm, but not too hot to touch, about 125-130°F. Stir the margarine mixture into the flour mixture. Add the egg and only enough of the reserved flour to make a soft dough. Dough will be ready when it gently pulls away from the side of the bowl and has an elastic consistency. On a lightly floured surface, knead dough for about 3 to 5 minutes. Place it in a lightly greased bowl and let rest for 10 minutes. After 10 minutes, roll the dough out in a 14x8 inch rectangle. Spread the softened margarine on top. Mix together the cinnamon and sugar and sprinkle it over the margarine. Roll up the dough tightly and cut into 11 even pieces and place in a lightly greased 9-inch round pan or pie dish. Loosely cover the rolls with aluminum foil and allow to rise in a warm, draft-free place for 60 and 90 minutes. After the rolls have doubled in size, preheat your oven to 375°F. Bake for 25 to 30 minutes, or until lightly browned. Cover the rolls with aluminum foil after 15 minutes to avoid heavy browning, if you prefer. Whisk the glaze ingredients together in a medium bowl. 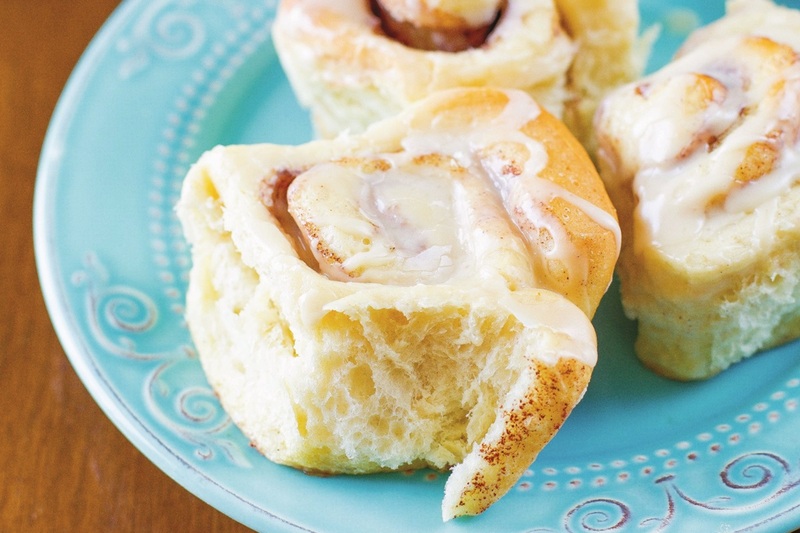 Top the cinnamon rolls with glaze right before serving. Any active yeast will make a good cinnamon roll, but the Red Star Platinum has dough conditioners to offer a lighter, fluffier result. I know that some dough conditioners are dairy-based, but Platinum is dairy-free, egg-free, vegan, and certified kosher parve. It does contain soy flour, though. BEST RECIPE EVER!!! These were perfect. I haven’t had a cinnamon roll in over a year, so you made me very happy. I’m so happy I could brighten your day Rachel! I am so happy to have found this site. I recently went dairy free and couldnt believe it when i saw you could make cinnamon rolls dairy free! I’ll be adding this to my recipe book for a future baking! BEST Cinnamon rolls..I made these this evening and they turned out perfectly! They were pretty easy to make and a delight to eat..I’m so happy I found a dairy-free cinnamon roll recipe. Thank you!!! Fabulous! Glad you enjoyed it Sarah. I made these with Namaste Gluten free flour and they were delicious! I also used Coconut oil instead of dairy-free margarine. Awesome! Thank you for sharing the gluten-free flour blend that worked for you in my cinnamon rolls Kristin! I appreciate dairy free recipes as my son is lactose intolerant. HOWEVER, margarine is not only loaded with actual lactose, it is just nasty on your body. that hydrolyzed crap is beyond unhealthy. Might I suggest either using organic ghee, a lactose free real clarified butter or almond butter? I am disappointed that this recipe suggests that it is dairy free, when it is really hard to find any margarine on the market that is truly dairy free. Read your labels people. Im pretty sure the article gave many examples of dairy free items to substitute instead of butter. You may want to spend more time reading and less time preaching. I have made these twice now and they are absolutely amazing! Can you put in fridge over night before baking? Also can I freeze once made or before. Would only need 4-5 at a time!! 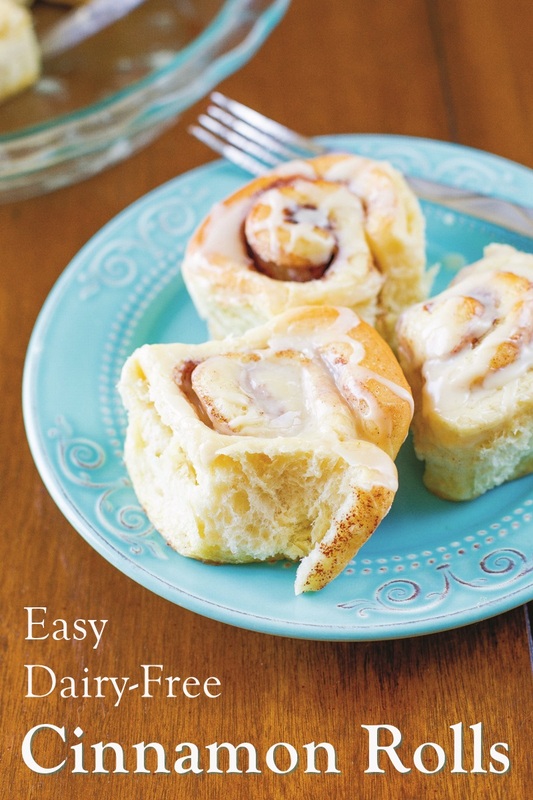 Hi Melissa, I would use this recipe – http://www.godairyfree.org/recipes/double-the-cinnamon-rolls-make-ahead-vegan-nut-free-soy-free – It’s my personal recipe and I do fridge it! The 14×8 dough rectangle was extremely difficult to roll tightly. The dough was very sticky as well, using the ingredients listed in the instructions. I’m so sorry that recipe was difficult for you. As noted in the post, my personal go-to recipe is here: http://www.godairyfree.org/recipes/double-the-cinnamon-rolls-make-ahead-vegan-nut-free-soy-free – It’s been made and enjoyed by hundreds of people! Cinnamon rolls always disappear in a flash around here so I love to have as many different recipes as possible…thanks for sharing this and for the vegan options too!